Sony has applied years of experience in professional media to expand the current high performance memory card line up with an ultra-fast speed model that will maximise your camera performance. Introducing the world’s fastest SD card, the SF-G series is the perfect accompaniment for your high-performance DSLR or mirrorless camera, offering up to 299MB/s write speeds, contributing to longer high-speed continuous burst mode shooting for high-resolution images with cameras supporting UHS-II. Available in 32GB, 64GB or 128GB storage capacity, this memory card’s blazing-fast write speed also allows for a shorter buffer clearing time, making sure you will never miss those life-changing moments or shots. 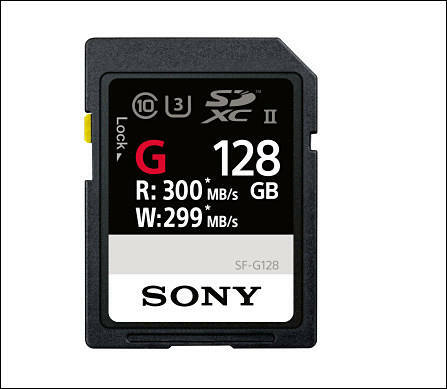 A Sony developed algorithm prevents loss of speed in data writing even after repeating burst shooting, and contributes to the camera’s speed of burst shooting – this is an SD card you can rely on. Another brilliant feature of this SD card is the ultra-fast read speed of up to 300MB/s. Paired with a memory card reader, the cards can transfer large volumes and file sizes to a computer very quickly, contributing to a more efficient workflow for professionals. “As the continuous shooting of higher-resolution images and adoption of 4K video with DSLR and mirrorless camera increases, the inherent need for larger, faster and more reliable cards becomes apparent. Thanks to the SF-G series, we continue to show our commitment to providing a full range of extremely high performance media devices to professional photographers and enthusiasts, maximising their camera performances” said Romain Rousseau, European Product Marketing Manager. Sony’s SD products are highly reliable and durable and offer such features as water proofing and anti-static protection which help keep your precious contents safe. But when you are out all day shooting fast with time at a premium, accidental deletion of images can happen. With Sony’s free downloadable File rescue software, you can quickly recover deleted images or videos, including RAW images and 4K XAVC-S video files. In conjunction with SF-G series, Sony is introducing a new memory card reader, model MRW-S1, the perfect solution to drastically improve workflow efficiency after shooting by quickly transferring large data from SF-G series SD cards to a PC. This compact card reader offers an in-built SuperSpeed USB (USB3.1 Gen.1) standard A port for cable-free PC connection, so that your files can be copied faster than copying through the SD slot on a PC. The new SF-G series SD cards will be available in stores in March 2017 and the MRW-S1 card reader will be available in stores in April 2017. Seems odd these don't have a V90 rating though as looks like they will far surpass it? Although minimum write speed always the difficult stat to find for any given card. I use a 95 MB/s card and always find the wait for my a7rII to write files (when shooting RAW and in burst mode in full quality/bit) annoying...would a card like this improve this matter? Most probably no, as you need camera to support such card. Dear Panasonic: now there is 299MB/s cards available. Please add mode higher than 400mb/s. At least in anamorphic mode. These cards don't have the Vxx rating. Any idea if they'll be good for the 400Mbps in the upcoming firmware for the GH5? Any idea if they'll be good for the 400Mbps in the upcoming firmware for the GH5? They must work, but much cheaper options exist. 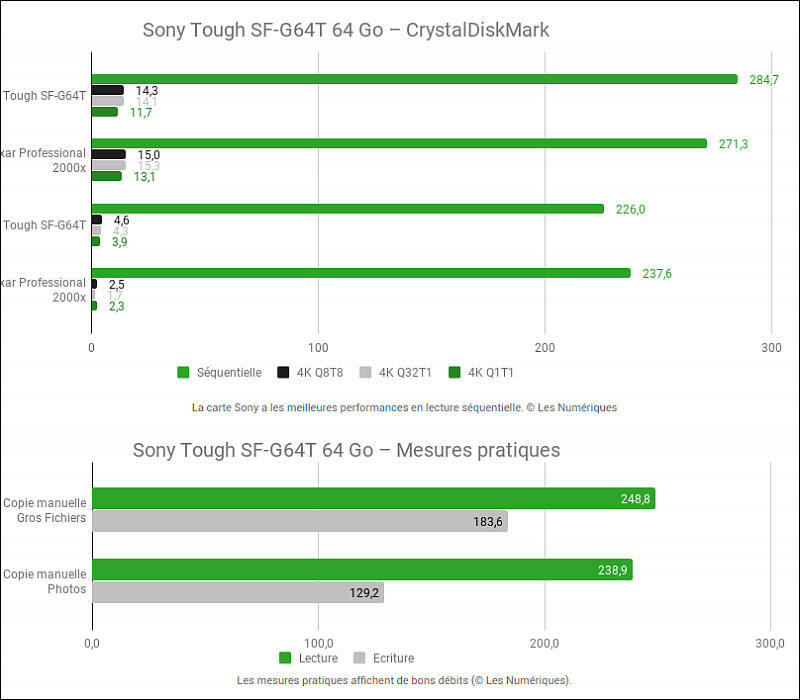 Looking for fast and hopefully cheaper SD cards for GH5, VK where are the cheaper options, thanks?